Black holes are a crucial part of the great cultural legacy of Einstein’s theory of general relativity. They have fascinated scientists and laypeople alike since they entered the public consciousness in the latter half of the 20th century. But it may be time to say goodbye to the notion of regions of space so dense that even light becomes trapped within them. In the last year or so, an intense debate about the paradoxical properties of black holes has left a number of theoretical physicists, including Stephen Hawking, suggesting that black holes might not exist at all, at least not in the form that anyone had imagined. If they’re right, it may finally be time to say goodbye to one of the most exotic objects in the theoretical universe. The black hole may finally be dead. First some background. Stars form when matter becomes dense enough to generate a gravitational field that compresses matter to the point where atoms fuse and release energy. This energy release prevents further collapse—throughout a star’s lifetime, its gravitational collapse is balanced by its thermal expansion. Theoretical physicists have long predicted that black holes form when massive stars stop producing energy at the end of their lives. When that happens, thermal forces cease and the gravitational collapse takes over. If the star is relatively small, like the sun, the gravitational forces are not strong enough to overcome the force between neutrons and this stops the collapse forming a neutron star. But when much larger stars end their lives, there is no known force that can stop the collapse. Consequently, theoretical physicists have always assumed that the collapse must continue until the star becomes infinitely dense and forms a singularity in the fabric of space-time. The gravitational field around such a star would be so intense that not even light can escape. Hence the name “black hole”. That’s never been an entirely satisfactory approach. Many physicists scratch their feet and stare at the ground when confronted with the idea of an infinitely dense object. What’s more, the mechanism of collapse does not take into account quantum gravity, a theory that that is not yet fully understood in such extreme conditions. It’s quite possible that a better understanding of quantum gravity could point to an entirely different result. Indeed, that’s exactly what appears to be happening. In the last few years, theoretical physicists have begun to think about what happens to information when it falls into a black hole. The general feeling is that information cannot be destroyed in this process and yet that’s exactly what seems to happen. Information is ultimately carried by quantum particles such as photons. So at issue here is the nature of quantum mechanics. A fundamental postulate of quantum theory is that all the information about a system is encoded in its wave function and this always evolves in a way that conserves quantum information. 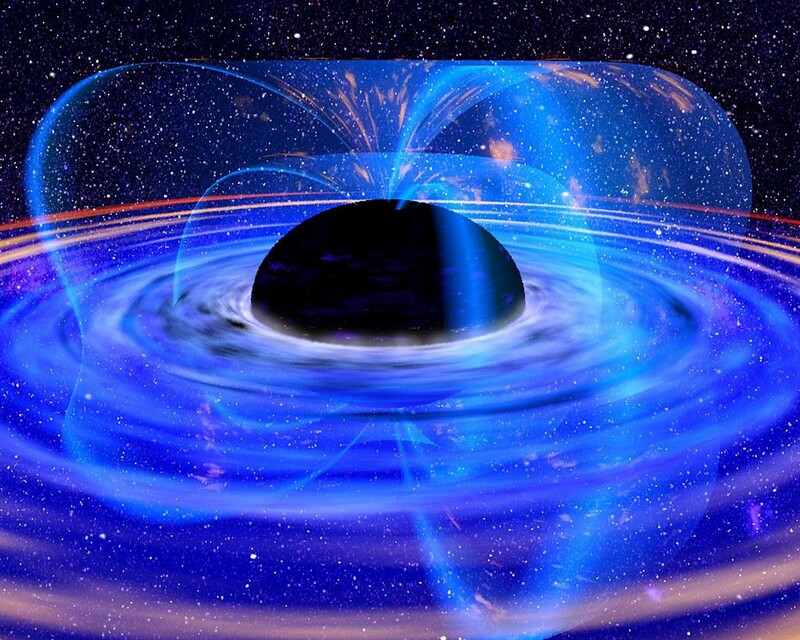 But the quantum information associated with matter that enters a black hole seems to devolve into a single state. When that happens, the information must be lost. This information paradox has triggered some intense soul-searching. And as a result of this, Stephen Hawking proposed a potential solution earlier this year. His idea is that gravitational collapse can never continue beyond the so-called event horizon of a black hole beyond which information is lost. Gravitational collapse would approach the boundary but never go beyond it. Today, Cenalo Vaz at the University of Cincinnati takes this idea and runs with it. The question he tackles is this: if a dead star does not collapse beyond the event horizon and so does not produce a black hole, what does it end up like? To find out, he models the quantum behaviour of dust as it collapses towards the event horizon. “In this simple model, the picture that emerges is very different from the traditional view of a black hole,” says Vaz. In this new model, there are two important parameters. The first is the so-called Schwarzschild radius, which is the size of the black hole that would form in a conventional model. The second is the radius of the dust ball as measured by distant observer. The difference between these radii is a region in which the universe is unlike anything physicists have imagined. The total energy here is negative and quantum fluctuations are likely to dominate. But exactly what goes on will depend on the exact model of quantum gravity that turns out to be correct, something that physicists are some way from determining. By contrast, the behaviour outside this region is strangely conventional, says Vaz. The collapsed star should swelled to about twice the radius of a conventional black hole. There is no event horizon and the space-time geometry is regular. “Observationally, what is being encountered has more in common with a neutron star, except that what holds the system up is not matter degeneracy pressure but vacuum energy,” says Vaz. What’s interesting here is that there is plenty of observational evidence that highly dense objects exist in the universe, some of them on a supermassive scale. For example, the supermassive black hole, or something like it, that sits at the very centre of the Milky Way galaxy. Vaz isn’t disputing the existence of these superdense objects, just what they look like. What he and others are saying is that these objects are not black at all. Indeed, it should be possible to observe them, just like ordinary neutron stars. The difficulty, of course, will be to distinguish them from traditional neutron stars. If Vaz and co are right, astronomers are set to have some fun hunting for these exotic objects. Time to get looking.